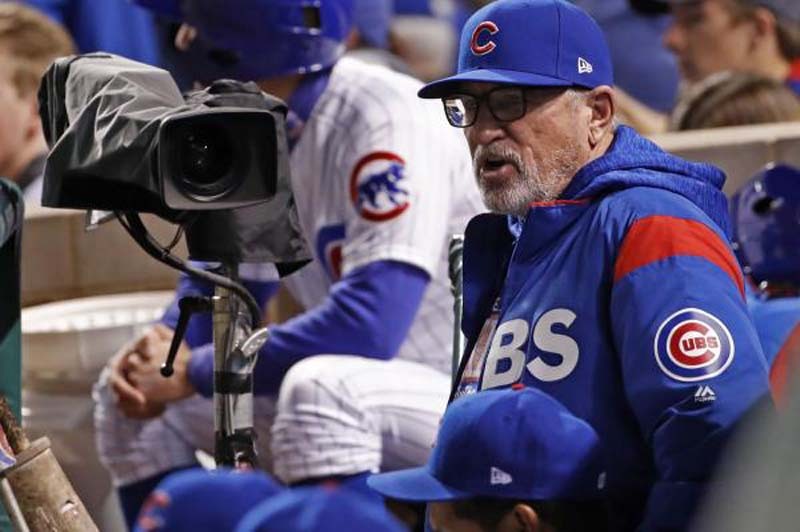 As banged up as the Chicago Cubs may be these days, manager Joe Maddon certainly isn't willing to take any chances that could impact his team's long-term hopes in the National League. But on a day when third baseman Kris Bryant's shoulder kept him out of the lineup for a second straight day and second baseman Javier Baez didn't start because of a knee bruise he had sustained the night before, the Cubs still found a way to win. Now, with Bryant expected to miss another game and with the pitching staff anything but at 100 percent, Chicago will attempt to earn a series split against the Arizona Diamondbacks on Thursday at Wrigley Field. [post_ads]Bryant, who missed 16 games with shoulder inflammation in late June and early July, could be headed back to the disabled list after he hit .250 in the games since he returned from his earlier stint on the DL. "I can't promise you (he'll play Thursday) either," Maddon told reporters on Wednesday. "We're just going to try to go day by day and figure this thing out It's just a matter of controlling it. I have to listen to him and the docs now, and we'll try to make a determination. I don't have anything long term positively or negatively. I'm just going on a day-by-day thing." As for Baez, who entered the game as a pinch-hitter in Wednesday's 2-1 win and reached on a single that turned into the game-winning run, Maddon isn't certain whether the All-Star second baseman will be in the lineup when the four-game series wraps up. "I will wait and see," Maddon told reporters. "He looked at me like he was OK to run, but I didn't want to do that at second base." Tyler Chatwood, who scored the go-ahead run in the eighth inning after he replaced Baez as a pinch-runner, will start on Thursday. Chatwood (4-5, 4.84 ERA) is coming off one of his best starts of the season after he allowed just one run and one hit over 5.1 innings against the St. Louis Cardinals. Chatwood is 5-3 with a 4.09 ERA in 11 career starts against the Diamondbacks. Arizona saw its three-game winning streak snapped with Thursday's loss and had a pair of errors -- the second of which led to setting up the go-ahead run in the eighth. The errors proved costly, especially after Diamondbacks starter Robbie Ray held the Cubs to just a run and four hits over seven innings. Despite the loss, the Diamondbacks will still have the opportunity to capture the series with a win on Thursday. Zach Godley (11-6, 4.65) will get the start for Arizona and will be looking for his third win in his past five starts. Godley hasn't taken a loss since July 1 and is coming off a no-decision against the Colorado Rockies in which he allowed four runs (three earned) and struck out six over five innings. The Diamondbacks have been looking for ways to shore up its pitching staff as they continue to push for a division title. Arizona picked up relief pitcher Matt Andriese from the Tampa Bay Rays on Wednesday in exchange for minor leaguers Michael Perez and Brian Shaffer. They might not be done. "We were just looking to continue to add pitching," general manager Mike Hazen told reporters. "We'll see what happens for the rest of the next six to seven days. We're still actively looking for ways to upgrade the club wherever we can. Nothing imminent, but we're still engaged with a bunch of different teams."